Can I volunteer with GEN? If you are interested in volunteering with GEN or any of our regional networks, you can sign up here as a volunteer. Please note that the majority volunteer opportunities with GEN are project-based, remote support. This means you don't have to be in a community to offer this type of support. For example, you could be helping with communicating upcoming GEN events, or using your design skills to create educational materials, or checking our ecovillage database is up-to-date, or translating an article. We get a lot of requests to volunteer with GEN and we don't have the capacity to reply to or accomodate everyone all the time. You are welcome to contact us more than once if we haven't immediately replied to your inquiry. We have a lot going on and appreciate your generous spirit. We will reach out as we have projects you can plug into. How can I join/visit/volunteer with an ecovillage? If you want to volunteer in or join an ecovillage/community project, it is best to contact them directly via email. On our ecovillage map you can find all the projects that are currently posting there information with GEN, including contact details. We are in the process of updating our ecovillage database so check back with us regularly to see if there are new communities you can connect with. How does GEN define ecovillages? "ECOVILLAGE: A rural or urban community that is consciously designed through locally owned, participatory processes in all four dimensions of sustainability (social, culture, ecology and economy) to regenerate their social and natural environments." 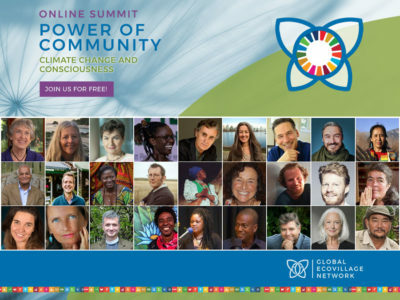 GEN invites ecovillages to be recognized in our network. You can find out more about our criteria for recognition, how GEN defines ecovillages and other types of community arrangements in GEN's Glossary. How can I start my own ecovillage? Ecovillage Incubation Programme: Run by GEN Education, this initiative provides mentorship, training, networking and resources to support you to realise your dream. This solution-oriented programme is based on learnings, tools and insights from established ecovillages, distilled into resources, models and methodologies useful for any group that recognises the value of community. Ecovillage Development Programmes are run by GEN or by GAIA Education in the form of Ecovillage Design Education (EDE) courses. If you already started your project and you have a location, you can create a page on our ecovillage map so people can find/hear about you. If your project is not ready for this, reach out to projects that you are interested in, check out what is already out there, maybe visit some established or starting projects and learn directly from existing ones. Check out the Solution Library to give an overview of what can be done and what people do to live out the four dimensions of sustainability within a whole systems design framework. It does not necessarily tell you how to build an ecovillage yourself but you might find useful tips for specific aspects like clean energy production or group decision-making processes. Also connect with your regional GEN network, they might be able to give you advice for the specific region. You can contact them here. Visit our online Market for resources and educational materials. Finally, check out past GEN Webinars and keep an eye out for more upcoming ones. Where can I find ecovillages in a specific area? The easiest way to find an ecovillage in a specific area is by using our ecovillage map where you can search by region, country and type of community. Features of the site, including purchases in the Market, all posting of projects and solutions, and commenting work best when you are logged in with a profile on our site. To create a profile or access your profile, click on the "Log In" section on the top right of the homepage or bottom left corner under Resources or here. If you forgot your password, click on the lost password button on the "Log in" page. If your entry on the ecovillage map or solutions library does not appear as you make edits or new entries, this means that it is still under moderation. Our communications team moderates all new entries to avoid spam, advertising and to check if entries have all the required information. If you want to update your ecovillage page but the user who uploaded it is no longer part of the project, contact us and we can change the name and email address and generate a new password. Unfortunately, GEN does not have the finances to fund every project/ecovillage. We are constantly working to increase our capacity so we can directly support more projects on-the-ground. Nevertheless, you can connect with your regional network as they work directly with communities and may have local knowledge about possible sources of funding. They probably cannot directly fund your project but may be able to point you in the right direction. Each year we run the Hildur Jackson Award: a €3,000 annual prize that aims to support and honour projects around the world that are demonstrating regenerative best-practises in all dimensions of sustainability. Keep an eye on our site and our newsletter for the opening of this annual initiative. We offer different programmes to support and help developing projects. GEN Consultancy aims to interlink experts in regenerative technologies throughout the GEN networks to those that are seeking such support.You can find all these programmes on our website along with the possibility to contact our Consultancy team. We invite you to add your project to our ecovillage database/map or to our Solution Library. Due to capacity, we cannot share all crowdfunding/EVS/project links on our Facebook page or other social media. We receive quite a few requests like this, which is why we have a policy to only share request from registered members of our network with prior notice. If you are running an event and want to publicise it, then please add to our Events Listing. We are in awe of the thousands of beautifully healing and culture shifting projects, movements and organisations working globally. We are truly experiencing a global shift to a culture of regeneration. If you are looking for a partnership/cooperation with us as NGO or associations, we would like to encourage you to contact us.